According to a recent report, a new app is allowing Australians to record sightings of brush turkeys in their local area. The data gathered is contributing to a collaborative research project run by the University of Sydney, Taronga Conservation Society and the Royal Botanic Garden Sydney. Brush turkeys used to be rare because of over-hunting during the Great Depression but they have made a comeback and are increasingly common in suburban areas. This has created a unique human-wildlife conflict situation as some people are irritated by brush turkeys digging up their gardens, while others are happy for more close contact with native species. Researchers have been tagging turkeys at Taronga Zoo and other areas in Sydney, observing their behaviour and tracking the birds with GPS in an effort to understand their population dynamics, movement patterns and general social behaviour. The aim of the project is to determine how brush turkeys have adapted so quickly to urban environments and what makes them geared towards urban life. Brush turkeys are an Australian native bird with an unusual form of reproduction. Rather than brooding their eggs, they construct huge nest mounds out of soil and leaf litter of up to three tonnes, which keep the eggs warm. The chicks, once they hatch, live completely independently of their parents. 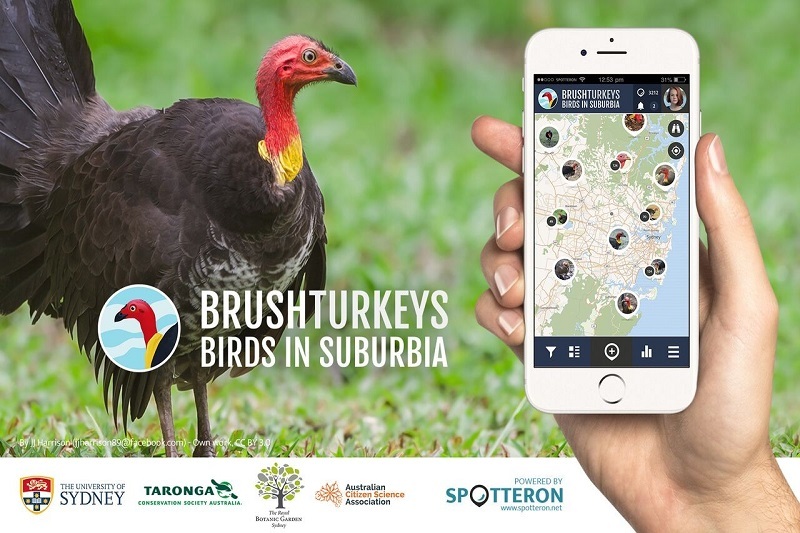 The Brush Turkeys: Birds in Suburbia app is now allowing Australian citizens to record their own observations and assist with this research. The app concept won the Australian Citizen Science Association’s ‘Spotteron Competition’ at the 2018 Citizen Science convention. Launched in September, it allows users to report their sightings of brush turkeys and provide information about their behaviour. People can add details such as where the turkeys are foraging, and the foods they are eating, where they are building their mounds, and whether there are chicks present. This is information that the researchers may not be able to get out and find themselves. Brush turkeys gained legal protection in the 1970s and since then, have taken to reclaiming not only the bush but the cities. The cities are dangerous playgrounds for independent turkey chicks. In the past decade there has been an increase in the number of urban turkeys colonising south-east Queensland and northern NSW. Researchers are encouraging citizens all over Australia to download the app and report what they see. It has been really inspiring and exciting to see the response to the app so far. Within three days of the launch, the number of reports on the app already outstripped the number of brush turkeys the researcher had personally tagged in the whole first year of his PhD. Citizen science projects such as this are really important. The aim is to get people to appreciate the environment around them. The app is also teaching people data collection skills and getting them to participate in efforts to protect these species. This data is really valuable for the broader ecology work and conservation.